President Ho Chi Minh once told us that “Invalids and families of soldiers and martyrs are the persons having meritorious service to the Homeland and the people. Thus, we must be grateful for, love and assist them”. Imbued with his instruction, our Party, State and entire society always attach great importance to the work of invalids, martyrs, people with meritorious service and military rear policy, making contributions to further improving material and spiritual life of beneficiaries, maintaining socio-political stability, generating high spiritual motivation for the cause of national construction and protection. Promoting the country’s tradition of “Remembering the source when drinking water”, over the past years, the Central Military Commission and the Ministry of National Defence have directed organs and units to grasp and seriously implement resolutions and directives of the Party and the State on the work of invalids, martyrs, revolutionary contributors and military rear policy, step up the work of propagation and education to raise cadres and troops’ awareness and responsibility towards this work, and closely work with central committees, ministries and sectors to promulgate and implement documents stipulating entitlements and policies for invalids, martyrs, persons with meritorious service and military rear. In this regard, functional organs of the Ministry of National Defence have been active in working with those of the Ministry of Labour - Invalids and Social Affairs to suggest, promulgate and implement documents on offering entitlements and policies for the wounded and the dead during their performance of defence and security tasks. The search and collection of martyrs’ remains under the Politburo’s Directive 24/CT-TW, dated May 15th 2013, and decisions of Prime Minister have been carried out effectively. A lot of set of martyr’s remains have been found, identified and repatriated. Implementing Ordinance 26/2005/PL-UBTVQH11, dated June 29th 2005, amended and supplemented Ordinance 35/2007/PL-UBTVQH11, dated June 21st 2007, by the 11th National Assembly Standing Committee, and amended and supplemented Ordinance 04/2012/PL-UBTVQH13, dated July 16th 2012, by the 13th National Assembly Standing Committee on giving preferential treatment to the persons with meritorious service, the Central Military Commission and the Ministry of National Defence have directed the whole military to offer existing entitlements and policies to people with meritorious service under the military’s management. The movement of “Repaying gratitude” has been implemented effectively armywide with practical activities, such as the Program to build Houses of Gratitude, Houses of Comradeship; presentation of medical equipment to invalids sanatoriums; Heroic Vietnamese Mothers service; provision of employment for offspring of martyrs and invalids; presentation of gifts to and provision of free medical examination, treatment and medication for beneficiaries and persons with meritorious service; repair and embellishment of martyrs’ cemeteries; donation of money and presentation of savings books to preferential policy families, etc. Since 2007, organs and units in the entire military have mobilized over 618 billion VND for the “Repaying Gratitude” Fund; built around 13,500 Houses of Gratitude; and provided employment for more than 340 offspring of invalids and martyrs. Celebrating the 70th Anniversary of War Invalids and Martyrs’ Day, the whole military has contributed nearly 22,000 working days and 60 billion VND to construction and repair of martyr memorial works. At present, most of invalids, martyrs’ families and persons with meritorious service have above-average income together with employment and houses. Many works serving the people’s life, such as bridges, roads, schools, military and civil infirmaries and so on have been built and run effectively, contributing to acceleration of fulfillment of the “hunger eradication, poverty reduction” goal and improvement of living standards of the people in general and beneficiaries in particular. Moreover, great importance has been attached to entitlements and policies for military rear. Those for families of soldiers, defence labourers and employees have been unceasingly completed, particularly for people in extremely difficult situations and working in isolated and remote areas, border areas, seas and islands. 100% of relatives of soldiers, defence labourers and employees have been granted health insurance cards. 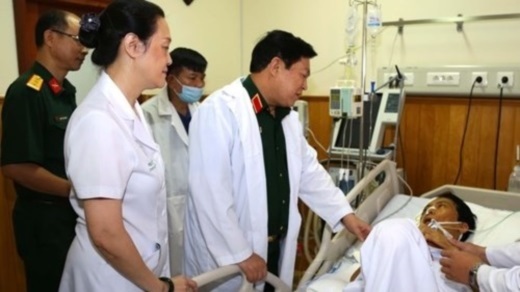 Importance has also been attached to visiting and giving presents to military retired cadres on national holiday, Tet, traditions days, and supporting people with fatal or mental disease, etc. Entitlements and policies for soldiers taking part in resistance wars, wars to defend the Homeland and international missions have been ensured. Up to now, more than 3 million people have been entitled to one-time or monthly allowances, health insurance, burial fees and so on according to the regulations issued by the Prime Minister. Nevertheless, the work of invalids and martyrs, the policy for military rear and the “Gratitude” movement have exposed limitations over the past years. The work of disseminating entitlements and policies, especially new guidelines and policies of the Party and the State has not been carried out properly and effectively yet. Responsibility of several party committees and commanders towards the process of implementation and inspection has been limited. A number of cadres and employees in charge of policy work has yet to thoroughly grasp principles and procedures for entitlements and policies. In the upcoming years, the country’s cause of reform, Homeland construction and protection and international integration will witness both advantages and challenges that directly impact on its socio-economic development and policy for social welfare. The task of studying, counseling, directing and implementing policy work will be increasingly greater. The number of pending beneficiaries after wars are still large. To effectively conduct the work of invalids, martyrs, persons with meritorious service and the policy for military rear, party committees and commanders at all levels should take the following measures. First, continuing to grasp the Party’s viewpoint, the State’s policy and law on the work of invalids, martyrs, persons with meritorious service and the policies of military rear, sticking to leadership and direction of the Central Military Commission and the Ministry of National Defence on this work. Party committees and commanders at all levels should grasp and seriously implement resolutions, directives and legal documents of the Party, National Assembly, Government, Central Military Commission, Ministry of National Defence on this work, while stepping up propagation and education to raise cadres and soldiers’ awareness of the significance of the policy work and the “Gratitude” movement. The work of propagation and education must focus on making all troops, especially key cadres, fully understand the Party’s viewpoint and the State’s policy and law on the work of invalids, martyrs and policies of military rear, the nation’s tradition of “Remembering the source when drinking water”, wishes and requests of the people, particularly the beneficiaries, and socio-economic situation of the country and the locality. What is more, party committees and commanders at all levels should promote their role in leadership, direction and implementation to have guideline and policy of the Party, State and the military carried out sufficiently and correctly. Propagation and education for this work must be conducted regularly to arouse people’s sentiment and national tradition. Second, promoting role and responsibility of party committees and commanders at all levels towards the work of invalids, martyrs, people with meritorious service and military rear policy. Leadership and direction of party committees and commanders at all levels are decisive factors ensuring the implementation of policy work stuck to the Party’s viewpoint and guideline, the State’s law and policy, and reality. To this end, party committees, commanders, political commissars, junior political commissars, policy cadres at all levels should grasp and seriously implement the Central Military Commission Standing Committee’s Directive 368-CT/QUTW, dated June 12th 2016, on strengthening leadership and direction over the policy work for the military and its rear in 2016 - 2020 period. Party committees and commanders should be active in building up plans and measures in accordance with characteristics of their unit and locality, while associating the policy work with political tasks, mass mobilization, and the building of strong socio-political establishments. Moreover, it is necessary to closely work with functional agencies both inside and outside the military as well as localities to effectively carry out the work of invalids, martyrs, military rear policy and “Gratitude” movement; study and apply existing entitlements and policies for the military; focus on entitlements and policies for those performing special and new military tasks, and those working isolated, remote areas, border areas, seas, islands, etc. ; continue to implement the guideline on outsourcing the work of taking care of people with meritorious service to bring into play the combined strength of levels, sectors, localities and whole society in the new period; attach great importance to improving life of preferential policy families in difficult situations, people with meritorious service living alone and preferential policy families in isolated, remote areas and revolutionary bases. Third, actively renewing content and method to implement the military rear policy and “Gratitude” movement. Basing on preset programs and plans, leaders and commanders at all levels should keep a close eye on reality to propose flexible and concrete measures in accordance with the development of the country and the task of building the military and unit in the new period. It is important to innovate the “Gratitude” movement by multiplying effective models and good deeds; design proper content and creative action plans that are practical to both beneficiaries and nurture of patriotism and revolutionary tradition; complete the granting of entitlements and policies for those taking part in resistance wars, wars to defend the Homeland and international missions; accelerate the implementation of policies for conscripted labourers; be pro-active in proposing, promulgating and implementing policy for people with meritorious service living abroad under the guideline of the Secretariat. Fourth, promoting the combined strength of the whole political system to implement the work of invalids, martyrs, people with meritorious service and military rear policy. To effectively carry out this work, there should be proper mechanisms and policies to bring into play role and responsibility of organs and units, as well as consensus of levels, sectors and people. On the basis of their functions and tasks, organizations and forces should be active in exploiting resources and means, studying and proposing measures to conduct the work of invalids, martyrs, people with meritorious service and military rear policy in accordance with the country’s condition. It is important to continue carrying out the Campaign “The whole people take care of families of invalids, martyrs and revolutionary contributors” and the “Gratitude” movement; broaden international cooperation; step up the movement “Providing information on martyrs’ graves” nationwide; utilize sources of archives; and enhance the effectiveness of identification of martyr’s remains. Fifth, building and making the Military Policy Sector and cadres in charge of policy work strong to meet the requirements. Party committees and commanders at all levels should focus on consolidating structure of policy agencies; training policy cadres knowledge, advisory capability, skills and revolutionary qualities; successfully carrying out inspection and supervision to praise, award and multiply collectives and individuals good at policy work, rectify and deal with irresponsibility, negative phenomena and wrongdoings of collectives and individuals in charge of policy work. The 70th Anniversary of Invalid and Martyrs Day (July 27th, 1947 - July 27th, 2017) is a great event of the country for the whole Party, military and people to pay honour and tribute to those who bravely fought and sacrificed for national freedom, independence and people’s happiness. With special interest of the Party and State, efforts made by the whole society and people, we believe that the work of invalids, martyrs, revolutionary contributors and military rear policy will continue to reap good results in the upcoming time, making contributions to further perpetuating Vietnamese people’s tradition of “Remembering the source when drinking water” ”.